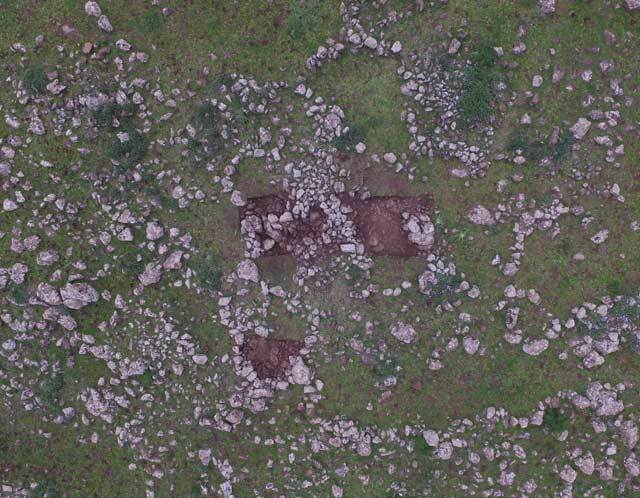 In February 2017, a trial excavation was conducted on the western fringes of Horbat Zalaf, south of Moshav Elifelet (Permit No. A-7909; map ref. 25165/76055; Fig. 1) prior to construction. The excavation, undertaken and financed by the Israel Antiquities Authority, was directed by U. Berger, with the assistance of Y. Yaʻaqobi (administration), M. Oron (flints), R. Liran (surveying and drafting), G. Fitoussi (aerial photography) and laborers from Kafr Manda and Majd el-Krum. The excavation was conducted along the western fringes of Ramat Korazim, in the upper part of a moderate, terraced slope at the head of Nahal Korazim and to its west, on the edge of a plain surrounding nearby Horbat Zalaf (Stepansky 2012: Site 328). The excavation areas are crossed by a streambed that is one of the tributaries of Nahal Korazim, on the banks of which are areas that have evidently been worked and shaped by traditional farming activities. A comparison of aerial and satellite photographs taken over the last hundred years reveals the extent to which destructive modern development has transformed the ancient landscape to which these areas belonged (Royal Air Force 1945). A sizable dolmen and tumuli field was identified in surveys conducted in the late nineteenth and early twentieth centuries CE (Kitchener 1877; Karge 1917; Turville-Petre 1931). 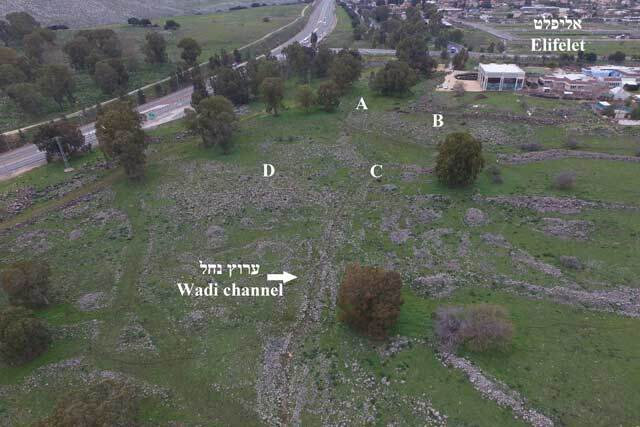 During surveying for the map of Rosh Pinna (Stepansky 2012: Sites 274, 318, 323, 325) it became evident that these features extend further west to the limestone area in the eastern foothills of Ramat Razim. 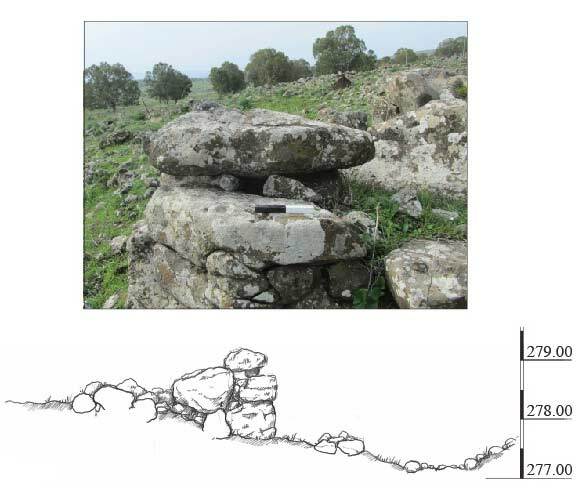 The dolmens identified at Ramat Razim (Stepansky and Bron 2011) may belong to the same complex. Two settlement sites were previously surveyed to the east of the excavation area: Horbat Duvshan and Horbat Zalaf. The former was occupied over several periods, and the second probably dates from the Chalcolithic period (Stepansky 2012: Sites 280, 328). The current excavation is the first to be conducted near Horbat Zalaf, which has never been excavated. Four areas were excavated (A–D; Fig. 2). Areas A and B and Areas C and D are separated by a strip of land that was disturbed by modern activity. Modern interference and destruction identified around the site determined the limits of the areas that were examined. Area A. An agricultural terrace was unearthed, and eight stone-clearance heaps were documented. Two excavation squares (5 × 10 m) opened along the agricultural terrace yielded two perpendicular field walls, built of two rows of stones preserved to a height of two courses. The walls were covered with a uniform deposit (max. thickness 0.5 m) that contained several small potsherds, worn to such an extent that they could not be dated. Additional field walls were discerned near the stream cutting across the area: a few stone courses or a row of stones protruding from the soil; the walls run parallel to each other and were identified in several sections along the course of the streambed, evidence of channeling and regulating the course of the ancient stream. Probes aimed at exploring the walls and the nearby soil recovered a few fragments of non-diagnostic, abraded flint items (Oron, below). Area B yielded an agricultural terrace and a series of stone-built remains. A structure (Fig. 3), unique in the excavated area, was identified at the center of the agricultural terrace, which faces south, overlooking the entire tract of farmland along the banks of the stream. The structure comprises a wide wall built of fieldstones, flanked on each side by a series of walls that form small enclosures. These walls are constructed of a single row of stones and preserved to a maximum height of two courses. Three squares opened within the enclosures exposed a uniform, relatively shallow deposit (max. depth 0.3 m) devoid of finds. Stone-cleared farming plots larger than the enclosures were also documented, as well as field walls and agricultural terraces. Area C. An agricultural terrace (L304; Figs. 4, 5) and its retaining wall were excavated on the east bank of the streambed. The terrace is one of a series of similar terraces, each delineating an elliptical plot (averaging c. 40 sq m) parallel to the streambed to the east. The plots are bordered on the west by a wall (W300) that separates them from the streambed. Circular stone-clearance heaps were discovered near the plots. When excavated, the plots were found to contain a layer of deposit (depth c. 0.5 m) devoid of finds. Area D. The ancient agricultural landscape on the west bank of the stream was damaged to a lesser extent than on the east bank. It retained evidence of cleared plots, field walls and agricultural terraces. One of the plots (L405; Fig. 4) and the area immediately to the east (L407) were excavated. One of the long field walls identified at the site (W401) is located nearby. The plot is delimited on the west by a wall (W406) that is generally better preserved than the rest of the walls at the site. Since no finds were recovered from the deposits above the walls and plots, they could not be dated. South of Plot 405, a small, closed circular structure (L404) overlooking the cultivated land to its south and east was excavated. The structure’s walls were built of fieldstones and preserved to a height of three courses; collapsed stone to its south indicates that it was once higher. A thin deposit devoid of finds was excavated in the cavity in the center of the structure. The structure’s plan and location suggest that it was a field tower or a base for a field tower (see e.g., Stern 2011; Zingboym 2012). A row of large boulders (W408; Fig. 4), probably partly man-made, was detected near the stream and perpendicular to its course. It was set on a bedrock outcrop, apparently the only worked rock along the course of the stream. At the end of the stone row stood a man-made feature: a dolmen-like structure (Fig. 6), which unlike the dolmens found at Korazim (Stepansky 2012; Alexandre 2017; Turville-Petre 1931) is rather small and lacks a burial cell—one of the main characteristics of such monuments (Fraser 2015). It comprised a stone slab that was laid on the worked bedrock, with small stones used to stabilize the slab and separating it from the bedrock surface. A similar stabilizing technique was used in dolmens found to the north of Tel Dan (Conder 1882) and at other dolmen sites in the country (Epstein 1985). Such dolmen-like monuments, which are relatively smaller than the more familiar dolmens and lack a proper burial cell, have previously been located in the dolmen field at Giv‘at Ha-Em (Hartal 2017: Site 98) and north of Tel Dan (Conder 1882). The excavation yielded 84 flint items (Table 1), all of which are probably in secondary deposition. They seem to have originated in an earlier site (sites?) in the region and subsequently washed in with alluvial soil. Most of the items are coated with a dark, reddish orange patina, and many are extremely abraded—distinctive characteristics of surface assemblages. The flint items consist mainly of debitage and debris (N=59), including chips, flakes and primary items. 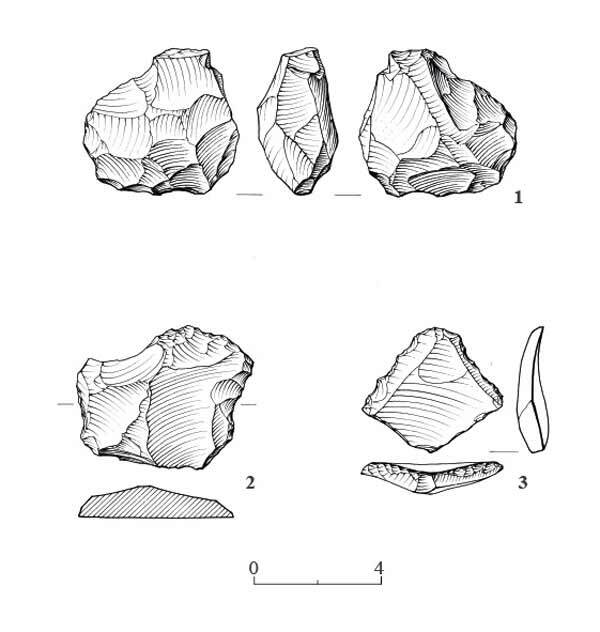 Levallois flakes (N=9) that can be associated with the characteristic technology of the Middle Paleolithic Mousterian culture are the only dateable finds. The assemblage contains eight cores, most of which are simple flake cores (Fig. 7:1) or core fragments; two of the fragments probably belong to Levallois cores. The tools in the assemblage are mostly ad hoc, and they include retouched flakes and blades (N=7; Fig. 7:2); notches (N=7), a third of which are on Levallois flakes; and a single Levallois point (Fig. 7:3). Despite the poor preservation of the site’s agricultural remains, it is evident that the style of their construction differs from that of the agricultural remains exposed at previously known sites dating from the Ottoman and British Mandate periods, e.g. at the village of Zangariyye (Zahluq; Stepansky 2012: Site 340) and in the region where Kibbutz ‘Ami‘ad now lies (Berger and Price 2018). Furthermore, no pottery was found that was characteristic of sites from these periods. Agricultural complexes are difficult to date (Gibson 2015), and especially so when almost no finds are recovered from their foundations. If the remains are not clearly associated with an ancient settlement, it is even harder to date the construction of an agricultural complex and its use. 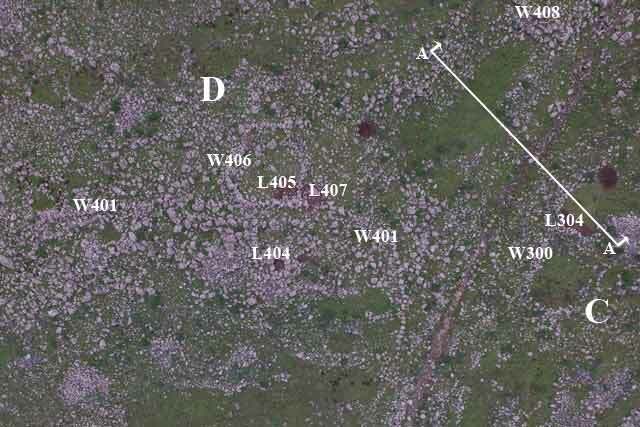 As in surveys conducted at Nafah, Na‘aran, Faraj and Ramtania in the Golan (Dauphin and Gibson 1994), an attempt was made to identify a relationship between the walls, along with stylistic differences. Accordingly, it appears that Wall 408 with the dolmen-like element at its end (Area D) and the walls of the built complex in Area B differ in style and appearance from the rest of the walls in the excavated area. It is difficult to determine whether this difference is due to chronological or functional factors. If it is a dolmen, it can be associated with the construction of dolmens in the north of the country during in the Intermediate Bronze Age (Stepansky 2005; Sharon et al. 2017), and to date the earliest farming activity at the site to this period. However, a British Mandate map from the mid-twentieth century CE indicates that plots were farmed in the excavation area, and that a large tract of land known as the ‘Valley of the Hummus’ (Marj el-Hummus) lay nearby—further testimony that the region was cultivated (Survey of Palestine 1941). The possibility that the excavated agricultural complex was used during the British Mandate period should therefore not be ruled out. The differences in style of construction may be due to factors that are not necessarily chronological. In conclusion, the site can be interpreted as having been farmed using traditional agricultural methods that may date back to the Intermediate Bronze Age and then revived during the British Mandate. Alexandre Y. 2017. Korazim, Kh. Umm el-Kalha. HA-ESI 129. Berger U. and Price M. 2018. ‘Ami‘ad (north). HA-ESI 130. Dauphin C. and Gibson S. 1994. 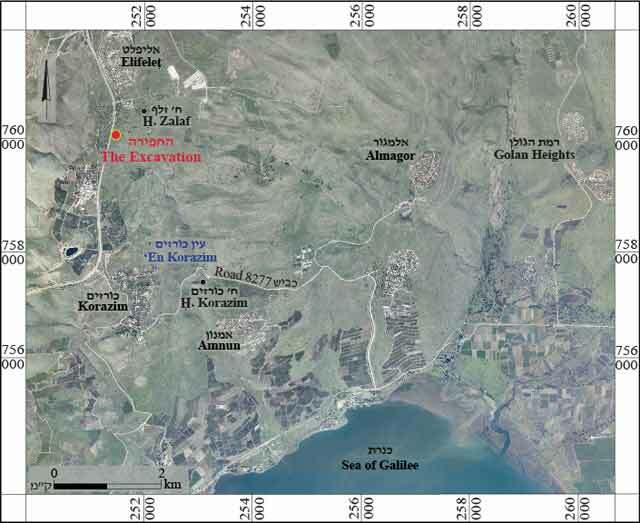 Exploring Ancient Settlements and Landscapes in the Golan: Results of a Decade of Surveys (1978–1988). Cathedra 73:3–25 (Hebrew). Hartal M. 2017. Dan (8) (Archaeological Survey of Israel). Stepansky Y. 2012. Map of Rosh Pina (18) (Archaeological Survey of Israel). Stepansky Y. and Bron H. 2011. Zefat, Ramat Razim (South), Survey. HA-ESI 123. Stern E. 2011. Karmi’el, Giv‘at Makosh. HA-ESI 123. Survey of Palestine 1941. Map of Rosh Pinna, 1:25,000. Palestine. The Center for Computational Geography: The Map Library and Aerial Photograph Archives, The Hebrew University of Jerusalem. Zingboym O. 2012. Ami‘ad. HA-ESI 124. 2. Excavation areas, looking north. 3. Area B, aerial view looking north. 4. Areas C and D, aerial view looking north. 5. Cross section in Areas C and D, looking northeast. 6. Dolmen(?) at end of Wall 408, looking northwest.